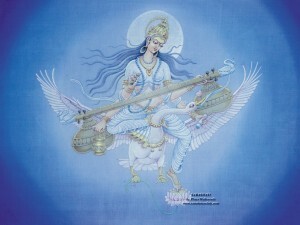 February is the month of Saraswati Puja and most of us have many sweet memories of this day. Although Saraswati Puja celebrates learning, education and the arts, the spring weather adds that extra zing of romance to the air on this special day. No wonder Saraswati Puja and Valentine’s day go hand in hand. This year New Jersey will be celebrating Saraswati Puja at different venues and different dates through out the month. Somerset Bengali Association (SBA) will be celebrating their Puja on Saturday February 9th at the Bridgewater Raritan Middle school, 425 Foothill Road, Bridgewater. Although the weather forecast doesn’t look too promising, the organizers are going ahead full steam to present a gala event spanning the entire day. SBA’s claim to fame is the food they serve during lunch and dinner. This year too they promise a sumptuous feast as well as a great entertainment show featuring local and invited artistes. On the same day, NJPA will be celebrating their Puja at the Community Presbyterian Church, 57 Sandhill Road, Kendall Park. Their puja will feature a variety of entertainment programs including a drama by Nupur Lahiri, Rabindrasangeet by Suparna Guha and many others. Ananda Mandir will be celebrating Saraswati Puja on Friday, 15th February, as per the lunar calendar and so will Bharat Sevashram Sangha. On Saturday, the 16th of February, Garden State Cultural Association (GSCA) will be celebrating their Saraswati Puja at the Woodrow Wilson Middle School, 50 Woodrow Wilson Drive, Edison. Their entertainment program will feature a hilarious play “Moner Boney” (written by yours truly) directed by Aparajita Das, along with other dance and musical presentations. And it goes without saying, dinner will be served. ICC Garden State will be celebrating this year’s Saraswati Puja on February 23rd, 2013 at the Randolph Senior Community Center located at 30 Calais Road, Randolph (next to the Randolph Public Library). Additional details may be found at their website – www.icc-gs.org.